There are several things that can contribute to hearing loss. Here are a few tips you can do to help prevent hearing loss. Noise exposer – If you have to raise your voice to hear; it’s too loud. Limit your exposure to sound. If you are in loud noise on a regular basis, your risk for permanent damage increases over time. A single blast such as a hammer hitting a nail just right can cause damage. Wearing hearing protection or taking breaks from loud noise can protect your hearing. 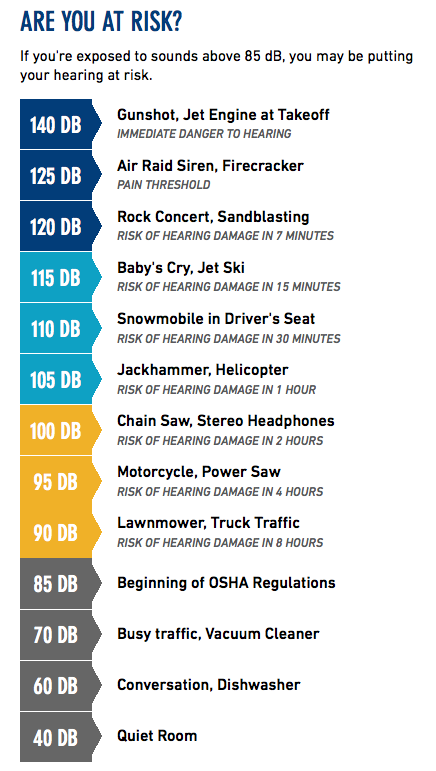 Activities such as mowing the lawn, blow-drying your hair, snow machining (snowmobiling), rock concerts and dirt bikes you should wear hearing protection to help keep your hearing. While hunting there is hunting protection that shuts down when you shoot so you can still hear when you are not shooting. Ototoxic Drugs – Some Medications are toxic to your ears and can cause hearing loss. Ask your pharmacist or physician if the medication you are taking is ototoxic and if it is, ask if there is a substitute medication. If you develop vertigo or you get a spinning sensation that can be aggravated by motion and accompanied by nausea. Smoking – Research shows smoking can make you more likely to lose your hearing. If you don’t smoke then avoid secondhand smoke because, that too can result in hearing loss. Earwax – ear wax buildup can muffle or deaden sound. DO NOT use a cotton swab that just shoves the wax in further or you could puncher your eardrum. You can try irrigating at home with a kit to soften wax and gently wash it out. If you have had eardrum puncher or surgery on your eardrum consult your doctor before flushing your ear canal. You can make an appointment with your hearing care professional or doctor and have them remove it. Age – The hair cells in your inner ears can break down over time they can die off. Vitamin D Deficiency – When we are low on vitamin D our bones can become weak. We have three middle ear bones that can become weak if they can also become weak. Also, to much vitamin D can be bad as well. Some illnesses – High fever like scarlet fever, meningitis and other illnesses that can give you a high fever or slow down your blood flow. Diabetes can also slow the blood flow in your cochlea causing hearing loss. Wear Hearing Protection – If you are going to be around loud sound wear hearing protection. Look for the NRR on the box when you buy earplugs. That is the Noise Reduction Rating (NRR). Whatever the NRR is, is the amount of sound that will be reduced. So, if it says NRR 30 that means the sound you are in will be reduced 30 decibels. Earplugs have to fit with a good seal for them to work. I the earplugs are loose then sound can get in abound the earplugs. Make sure you have a good seal. Earmuffs have to have a tight fit over both ears and a good seal to block out the sound. Ear infections – Ear infections over time can cause hearing loss. If your ear is wet like after swimming add a few drops of rubbing alcohol to dry your ears so they don’t get infected. You can also mix rubbing alcohol and white distilled vinegar 50/50 and put a few drops of the mixture in your ear canal to dry out your ear and help fight ear infections. If you have had eardrum puncher or surgery on your eardrum consult your doctor before putting any liquid in your ear canal. Occupational – Institute for Occupational Safety and Health estimates 30 million workers are exposed to high level noise that can cause permanent hearing loss.